MONDAY - We'll be eating out. Hubs has a business dinner. Emma has an orthodontist appointment at 4:00, and I have a middle school orientation meeting at 7:00. We will grab Panera or something similar. TUESDAY - Cherry Tomato Spaghetti with a side salad. WEDNESDAY - Chicken and cheese enchiladas. THURSDAY - Chicken kebabs with rice. FRIDAY - The 5th grade talent show is at 7:00. We'll pick up a pizza or grab something out after the show. SATURDAY - Grilled, make-your-own pizzas. What's on your plate this week? 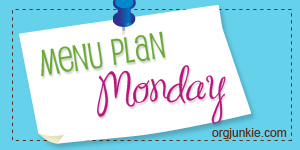 For more meal-time inspiration, see my meal planning posts, and stoop by I'm an Organizing Junkie's Meal Plan Monday to see what others are cooking up this week.